This very early mid 18th century Gambrel has been well cared for and has a quintessential country road setting. The rambling floor plan includes an expanded ell for lots of first level living space; featuring a first floor master suite; great room, and a library/den. There are three fireplaces, a front to back living room, a classic keeping room with stone fireplace, a cozy all natural wood kitchen and lots of nooks and crannies. The landscape has mature shade trees, flowering shrubs, lawn and meadow and a small pond ringed by stone walls. A detached two car garage with loft and natural lighting is on a small parcel across the lane. The peaceful setting is close to town recreation areas and town beach. 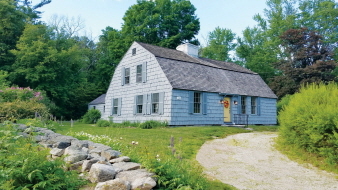 A unique, and very attractive attribute of the property – it offers a country setting with plenty of quiet and tranquility – but its less than 15 minutes to I-495 and 20 minutes to the Mass Pike. If you enjoy early architecture this may be your dream home.